Medical products are manufactured and packaged for sale around the world. These critical high risk products are subject to the most diverse climate conditions, whether it be extremely high air humidity or by contrast, extremely dry air. The air pressure at sea level is significantly lower than in the Andes or in an airplane. The packaging for these medical products must insure product consistency and potency from the Equator to the polar regions. This is not a problem for small tablets in blister packs but presents a bigger challenge for a two-component drug inhaler which is approximately the same size as a mobile phone. Waldner was faced with a specific challenge from one of the world’s largest pharmaceutical companies, “We were asked to securely package a mobile inhaler device for asthma patients. At the same time, this packaging also needed to be easily opened by physically challenged people.” reports Ralph Krauß, Packaging Machine Sales at WALDNER. The following pre-requisites were also required for the packaging and sealing machines: an output of 10,000 packages per hour – and dual control of all. 98% efficiency in a highly sensitive production environment….High OEE is a Waldner hallmark! 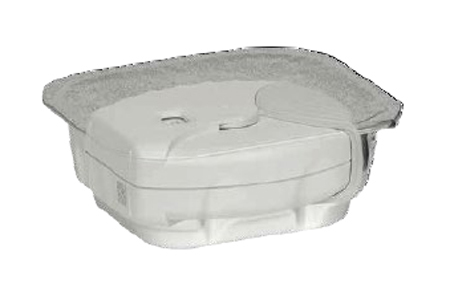 Functions, including active recipe and program management (active directory), as well as batch data selection and tracking by the higher-level line control, are now standard with the latest DOSOMATS for secondary packaging. Not a single parameter of the machine or recipe data can be changed without the operator’s access authorization, as well as a time stamp recorded and saved. In these highly sensitive working conditions, a minimum efficiency of 98% was also a pre-requisite. WALDNER was awarded the contract for this challenging project since the DOSOMAT has several hundred references for 14 of the 15 required machine functions (including clocking, cutting and inserting the dessicant, pick & place, high pressure sealing, cup marking and flap-folding). WALDNER was able to build and show the customer a flawless test unit for the fifteenth required function. Lines 8 and 9 were set up in the assembly building in Wangen. The machines went through a thorough FAT (factory acceptance test) before they could be delivered. “We are proud that we were also able to successfully realize this difficult application, thanks to the enormous diversity of the functions of the DOSOMATS and our ability to customize the machine for this challenging application,“ states Ralph Krauß. The inhaler is placed by a robot onto the infeed conveyor and then inserted into aluminium cups after multiple presence checks. Dessicant sachets have been previously placed in these aluminium cups, which are cut, checked for damage and then correctly positioned from a belt by a pick & place system in the base of the cup. 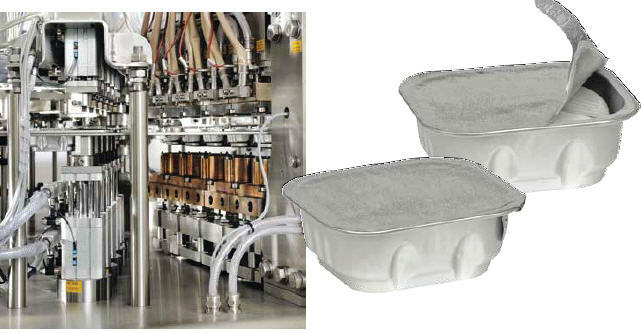 The filled cups are then sealed with a strong-walled aluminium plate by a servo-controlled high-pressure sealing system (with 50 bar and over 1 ton sealing force per cup for only 0.3 seconds). The cups containing the inhaler after sealing will withstand a bursting pressure of +/- 700 mbar within an hour, for instance if they are transported by plane from sea level to approximately 4,500 m above sea level. At the same time, they should be capable of being opened with a defined tear-off force of only 12 N (Easy-Peel). This equates to very little force which insures that all patients can access their medication. “A person weighing over 200 lbs. could stand on the cup without it bursting, and then the very next moment a senior or challenged person could open the packaging,” explains Ralph Krauß. To achieve optimum sealing parameters, state-of-the-art water bath vacuum control equipment is installed in the WALDNER assembly hall for bursting pressure measurement, and Zwick® testers are used for the peeling tests (seal removal tests).